I have a problem with the word contemporary. For one it pigeonholes/defines all the art that has come before, as what is most likely known by most, as classical art. Isn’t this classist? So essentially I have a problem with genres. Especially after taking a genre theory course in film. By the end of this course, I came to the conclusion that genres are confusing. There is too much bleed from one category to the other. Meaning they are not isolated, they are in fact predicated upon one another. Art does not happen in a vacuum. Also doesn’t the word contemporary define time as linear, when it might not be-all and end-all to that topic. What could possibly be a contemporary standard? The word has too much weight in my opinion, when in reality all art seems to me to be a document. A literal document, of the person who created it, and place (location). Essentially it is an object that generates language around and from it, which is producing a narrative/story. “Contemporary art is…produced by artists who are living in the twenty-first century. Contemporary art provides an opportunity to reflect on contemporary society and the issues relevant to ourselves, and the world around us. Contemporary artists…challenge traditional boundaries and defy easy definition.” 1. More wholly, contemporary art is a part of a larger cultural conversation. To contextualize this I believe that contemporary is simply art that academics made up to help us understand ourselves better, and to understand the work that is being produced at a rapid pace and by an ever-growing population of people. What I find interesting are the stories that can emerge from art work(s).“Narrative art is as old as humanity.”2. From finger prints/paint that humanity left behind on cave walls, to pottery, and even in the liminal spaces that performance once inhabited. Narrative art is a better umbrella term to help us understand art work in general, in all its manifestations, without getting into the nuances. There is a commonality between all the work, and that is a means of communication. A means of dialogue between a pair of people, a larger community, or if it is a private conversation we are having with ourselves or with god; “since only until recently art moved out of churches and into museums.” 3. Not only that, but by thinking about art as narrative by-passes misrepresentative connotations that stick to the artists when we deem them as contemporary artists. Although this may not be technically correct, thinking about it this way, for myself, helps me to make sense of what contemporary art really means in my life and how it functions in the world. “Understanding art is a process, just as creating art is a process.” 2. My feelings towards social media are ambivalent at best, especially towards Instagram. For one, I dislike when people constantly whip out their phones to record a moment or snap a photo of the food that has just been set down in front of them. I dislike how necessary it has become to share your life on your Instagram or Snapchat stories, rather than sharing experiences with the people who are with you. I dislike how visual my generation has become, on how focused we are on pursuing what is visually appealing rather than what is good. On the other hand, oversharing from other people has also put new restaurants and experiences on my radar. 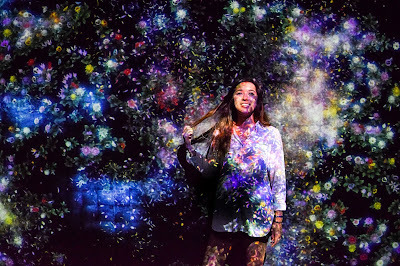 One such experiences was an art exhibition by teamLab. In 2016, I returned home from my first year at Duke excited to see my friends and family, but also to see the teamLab exhibition at Pace Gallery, in Menlo Park, CA. 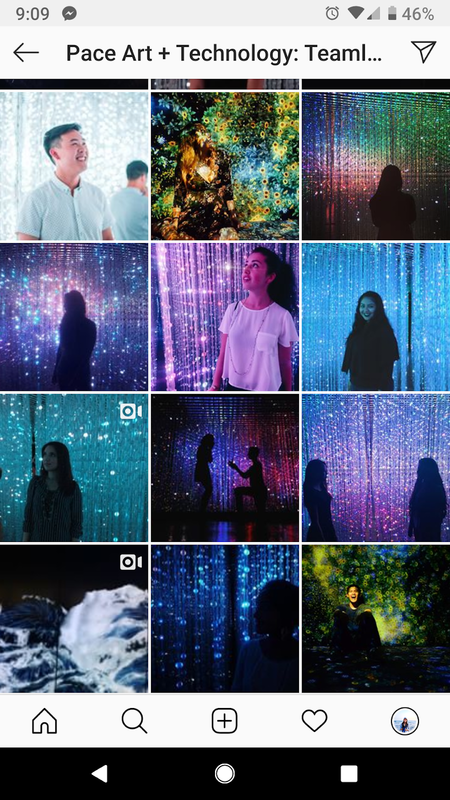 Despite being on the other coast for the majority of the past year, I had known about this digital art installation for months... because it was all over Instagram. All of my high school peers who had stayed in the area after graduation were suddenly posting photos of themselves in a stunning display of lights and colors. The installation looked beautiful, and clearly photographed well. Luckily for me, Instagram also has the option to tag where photos were taken. I had to go. I wonder sometimes, however, whether it was because I wanted to see this installation with my own eyes, or if I wanted a photo for Instagram too. A friend I went with was definitely the latter, but I am not so sure about myself. This digital exhibition was the first of Pace Gallery's Pace + Technology series, and featured the interdisciplinary collective known as teamLab. Founded in 2001 and based in Tokyo, the group seeks to "navigate the confluence of art, science, technology, design and the natural world." By using technology to break down the boundaries "between humans and nature, and between oneself and the world," teamLab creates immersive installations for viewers to view and become a part of. I went to the gallery and loved the experience. It was my first time experiencing art in this manner, and in the past year I've visited similar installations (one of Gustav Klimt's work at L'Atelier des Lumières in Paris, and Yayoi Kusama's "Gleaming Lights of the Souls" at Louisiana MoMA in Denmark). But I wonder whether I would have ever known about this type of contemporary art installations, if it were not for Instagram and social media. Needless to say, I did take quite a few pictures at the teamLab exhibition, and I certainly did post a photo to my own Instagram account. But beyond just the photos, I had been able to become one with the art in a concrete, physical way. I was able to see the artists' work projected onto my legs and dance across my arm. I was able to sit quietly and watch as the art moved along the walls, changing so organically I was never sure when or if the projections recycled themselves. I felt at peace surrounded by art that seemed almost alive. The art was not bound by rigid frames, nor was my experience interrupted by blank wall. This style of immersive digital installations has become my favorite way to experience art. I have always been a fan of classic art, dwelling in past affairs of the poetic conceptualizations that encapsulate the classic tastes. I enjoy the idea of preserving the past and expressing the immortal beauty of storytelling. I prefered my art to have set interpretations, the recognizable history right in front of you. Classic art is as it says, classic. I struggle with accepting new ideas; I like things the old way, the usual way. Because of this, I have always found it hard to grasp onto the general ideas of contemporary art. Contemporary art is a broad category and contains a massive and wide grasp as to what kind of art it contains. Contemporary art is generally defined as the modern art of today. I tended to stereotype the art form as to what I had assumed it was, cartoons and splatter paint. For years, I renounced the idea of abstract art and unusual subject pieces and I had told myself that there was only one way to art and that was the classic style. During my senior year of high school, my art teacher noticed my stubbornness and guided me to broaden my horizons. She started me on these mini artist researches, in which I must find a contemporary artist every week and create a small piece of you own take while utilizing some of their techniques and styles. I did what any angsty teenager would’ve done and just googled “contemporary artist”, clicked the first link, and then substandardly created a sloppy piece so I could move on. With each link, I ended up finding myself becoming more and more intrigued by certain artists and their modern styles. I eventually ran into the artist Peter Doig. Doig, born in Scotland circa 1959, was a contemporary artist who mainly focused on the ideas of magical realism, a topic that had heavily interested me in literature at the time. As a child, he continually moved with his family and was never provided a sense of stability guiding him to take on a more “free spirit” persona. At the age of seventeen, Doig dropped out of school but eventually took it upon himself to enroll in Wimbledon College to pursue a career in art even though “he had no real ‘natural drawing skill” (The Art Story). Doig really only began rising towards popularity in the early 1990s after he created this complex yet curious emotion behind his figure paintings. “Biography for Peter Doig (Born 1959).” Peter Doig Biography, www.peterdoigprints.info/biography.php?cur=GBP. “Peter Doig Biography, Life & Quotes.” The Art Story, www.theartstory.org/artist-doig-peter-life-and-legacy.htm#biography_header. Saatchi Gallery. “Peter Doig.” Cecily Brown - Pyjama Game - Contemporary Art, www.saatchigallery.com/artists/peter_doig.htm. In October 2018, a piece entitled “Portrait of Edmond Belamy” was sold at Christie’s Auction house for a cool $432,000. With the auctioneer’s gavel, history was made. The artwork, a dynamic and loosely-rendered portrait, was not a painting not created by a famous old master or today’s brightest visionary. Rather, it had been generated through an artificial intelligence algorithm. The sale was the first of its kind, a piece of artwork not generated by a person, but by computer. The ability to create art seems like a fundamental distinction between man and machine. Artwork, whether representational or abstract, is a subjective interpretation of the world. We imbue it with value because it can illuminate truths, challenge perceptions, and change perspectives. At a minimum, it can strike wonderment of the beauty that other humans can create on paper, transcribe in score, or chisel into marble. But does AI-generated art have this value? When increasingly smart computational models can produce artwork with indistinguishable quality from that created by humans, should the art world open its arms? 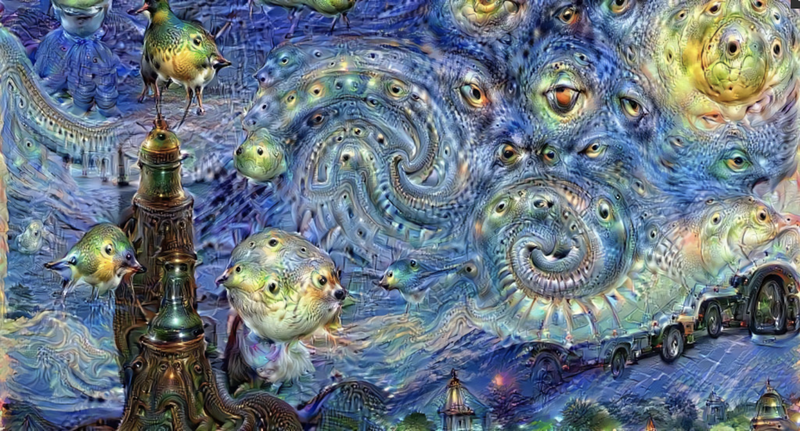 AI-generated art generally relies on technology called generative adversarial neural networks. These computational models “learn” both to generate samples which can realistically belong to a distribution—for example, generating an image which could easily belong to a library of real images-- and to distinguish samples that do not belong. They are tuned, trained, through a two-prong learning process: one network is dedicated to generating these realistic samples, while the other is tuned to distinguish fakes from real samples. Iteratively, parameters in the two networks are tuned so that they excel in their competing goals, arriving at a stasis where the generating network can dependably produce realistic images which the discriminating network can no longer dependably identify as fake. And the results are uncanny. Life-like faces belonging to no real person can be generated, videos of politicians or public figures saying outlandish things can be fabricated, prose seemingly belonging to well-known authors can be spun out. And fake artwork masterpieces could easily replace the canvases adorning museum halls and gallery walls. AI art-generators have been developed to impersonate everything from impressionist to modernist painters. The Google DeepMind algorithm notably depicts its “dreams” in psychedelic abstractions of every day objects, deconstructed and lingering just beyond recognition. These new advances intrigue and challenge me. The technology is exciting. The complexity encompassed in state of the art models exceeds the limits of computational power just a few years old. AI models are capable of intuiting abstract, high-dimensional features that humans cannot grasp. So invention, creation generated by these models at a minimum is technologically impressive. But while these models create new, yet familiar, artistic images, they do so in a method completely alien and opaque to even computational scientists. AI art generation lacks the human creative process of intuiting, planning, conceiving, and laboring. But when the results can be sold for nearly a million at auction and replace the best Rothko, is this human process actually obsolete? Why is contemporary art disliked? Modern and contemporary art is often ugly, hideous, vulgar, repulsive, trivial, unsophisticated, badly executed, crude and even foul smelling. Modern and contemporary art often show no or little artisanship and skill. Simply put: much of the modern and contemporary art tends to lack the attributes we tend to identify with ‘art’. Understandably, people feel cheated when they face modern and contemporary art; many feel deceived. They feel like the little boy in Emperor’s New Clothes: they see the emperor is naked. Everything boils down to the three basic values: truth, goodness, and beauty. What is beauty? What do we consider beautiful? Contrary to most people’s beliefs, beauty is not in the eyes of the beholder. The basic laws of beauty were discovered already in the Antiquity: the concepts of what is beautiful are pretty much universal. Try asking any girl what is beauty and being beautiful, and you get a downright dead honest answer - and that answer is not relative nor a social structure. It is the same in all cultures all around the world. Beauty is objective. 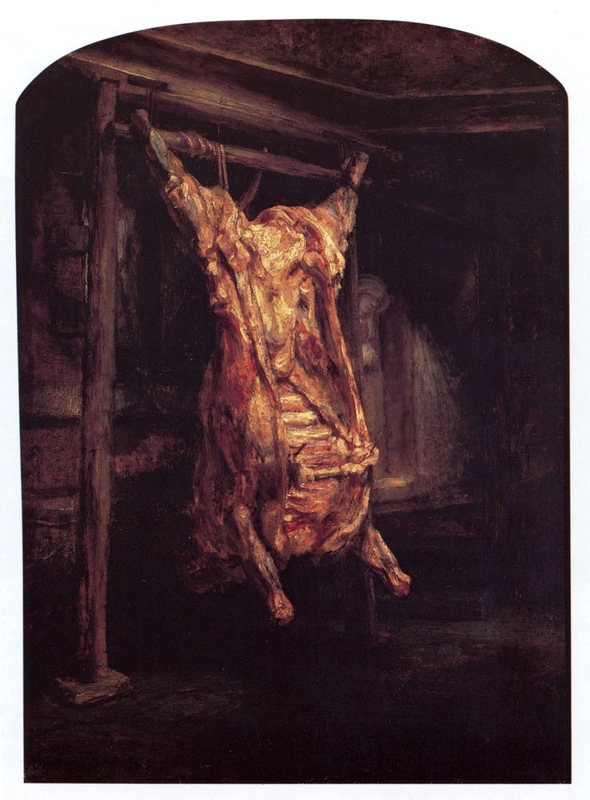 In contemporary art, the new theme is: Art must be a quest for truth, however brutal, and not a quest for beauty. So, the question became: What is the truth of art? Another argument is the intrinsic value of Novelty in contemporary art. Most contemporary art is easy to duplicate by any artisan- classical art is not easy to copy. The real value of contemporary art is in the fact that nobody has done it before. 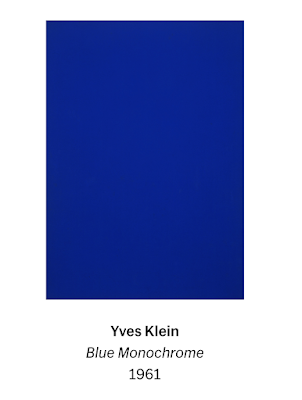 Yves Klein’s Monochrome(see bottom) square is easy to duplicate but no one before him had done it before. But would it be art if hung a white canvas on the wall, dipped my cat in blue paint, and had him roll over it? Certainly, it would be a novelty, and maybe contemporary art or not. Why I prefer contemporary art? Classical art is beauty and harmony. But beauty without honesty is deceit and not all beauty is art. True beauty should incorporate goodness within and if contemporary art can depict goodness through its less harmonious avenues, then I’d prefer that over beautiful Realism Soviet-era art. I have been drawing and creating small scrappy works of art since the age of five when my mother gifted me my first sketchbook. However, my true passion for creating art emerged when I was in middle school and, while my interest in drawing developed later, I was initially inspired to paint. 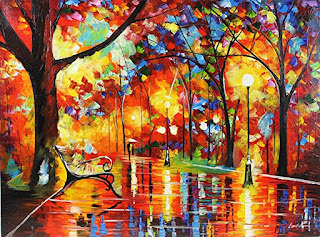 As a young artist searching for inspiration, no modern paintings inspired me more than the vibrant and harsh style of Belarussian-Israeli painter Leonid Afremov. 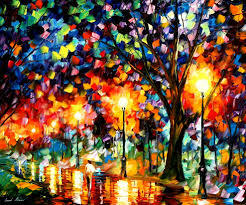 Leonid Afremov was born in Belarus in 1955, and began his studies as an artist at a Vitebsk university in Belarus. He originally began publishing art in the form of posters. However, due to the Communist Party’s insistence that the sole form of permissible art was propaganda for the Party, Afremov emigrated to Israel in order to pursue his visions as an artist. He ultimately relocated his studio to Florida, where he began creating and releasing his signature paintings. When I first found his paintings on the internet, I, as many of his other viewers, was immediately struck by the vibrance and contrast of the colors he used in his art. His paintings have no clear central theme or unifying message. Instead, he focuses on creating visually pleasing landscapes, tranquil park scenes, or paintings of famous landmarks. Each piece of art has a distinct nostalgic feeling, as the lack of central figures or evidence of human life in his scenes reminds of a time before the modern issues of overpopulation and environmental destruction. While many viewers might initially think that his art resembles the style of classical or impressionist painters, a closer inspection and insight into his intention shows that his art more closely resembles modern art. He uses broad, heavy-handed brush strokes not only to create a visually pleasing painting, but also to give insight into his process in creating the piece. 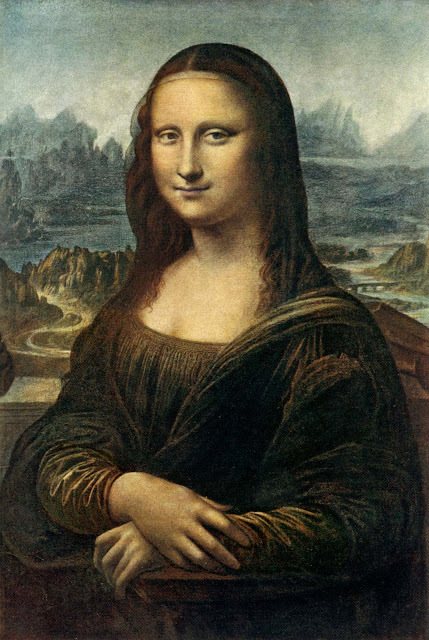 Many renaissance painters tried to create such accurate renditions of landscapes or portraits that they almost hid the fact the art was in fact a painting by blending the colors and the brush strokes. 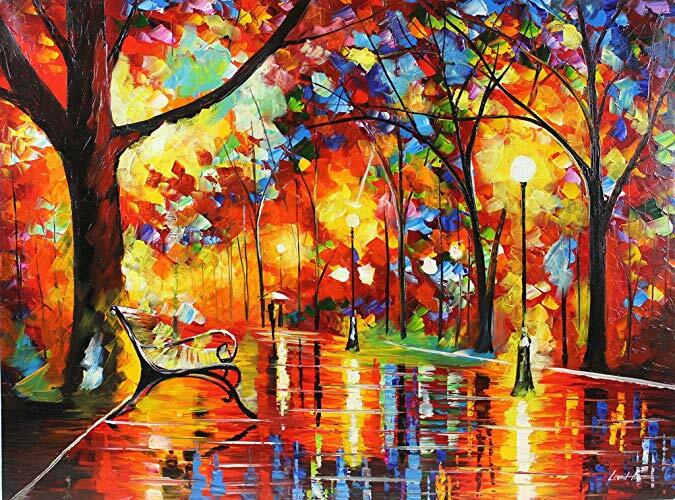 However, Afremov, armed with only a palette knife, uses both vibrant and striking colors such as oranges, reds, and dark blues, to highlight his own hand in creating the painting by using thick swatches of the paint and applying them to a more blended background. These swatches primarily mimic the dispersion of light across a colorful scene, and allow the viewer to appreciate not only the beauty of the scene, but the process which the artist went through to create this piece. I was immediately drawn to this aspect of creating art, which allows the viewer to appreciate even seemingly simple landscapes or portraits the may not have a distinct message as a work of art that an individual put effort and skill into. As a young painter and later in drawings as well, I enjoyed the challenge of creating pieces that seemed accurate at the surface, but where either small cross-hatching lines or unblended swatches of paint indicated that the piece was meant to be appreciated as a work of art rather than a photograph. From confusion to awe to a developing appreciation, my relationship with contemporary art has evolved over time. My first memories of art were my own contemporary “masterpieces,” abstractions created from glitter glue and finger paint. From a young age, my parents accompanied me on countless museum trips, and I remember never quite understanding what was so exciting about a huge canvas covered in solid red paint, or other contemporary abstractions. But these museum trips created a lifetime appreciation for art that eventually led me to attend a pre-college program at the Cleveland Institute of Art. The program was accompanied with free access to the Museum of Contemporary Art, or MOCA, which my friends and I happily took advantage of throughout the program. Concealed within the mirrored, geometric building was some of the most peculiar artwork I have ever experienced. I remember sitting in a dark room for at least half an hour, trying to make sense of Lu Yang’s animated work entitled Delusional Mandala. According to the MOCA website, the purpose of Lu Yang’s work was to “... investigate how neuroscience, medical and digital technology, and the Internet are changing society” (“Museum of Contemporary Art Cleveland”). This was my first introduction to the use of art to explore technology’s effects on society, an area I am exploring today. But Lu Yang’s imagery was wild; after staring at a variety of dancing body parts and psychedelic buses, I left feeling at once fascinated and a bit violated. This animation got somewhere deep inside my head, recurring in my memory throughout the next few weeks. Though I went into the exhibit somewhat skeptical, it had an incredible impact on me. Fast forward about a year and a half to this past winter break, when my family went to visit the Whitney Museum of American Art in New York City. I was weary of being pushed through crowds of tourists, but I entered the Whitney with an open mind, eager to see and learn something new. We first went straight to the special Andy Warhol exhibit. Of course, I was familiar with Warhol’s Campbell’s Soup series, but I did not understand the story of his life beyond the pop art designs most Americans recognize. From this exhibit, I gained insights into Warhol’s ever-morphing identity and opinions, from his sexuality to his political views. I left with a heightened understanding not only of the art, but also the artist behind the work. More exciting to me than Warhol’s exhibit was the exhibit Programmed: Rules, Codes, and Choreographies in Art, 1965–2018. From the Whitney website, “...Programmed traces how rules and instructions in art have both responded to and been shaped by technologies, resulting in profound changes to our image culture” (“Programmed”). Like Lu Yang’s work I had seen in Cleveland, this was an entire exhibit dedicated to the intersection between art and technology. This was the kind of contemporary art I could relate to. After years of confusion about seemingly forced deep meanings in contemporary art, I could see the meaning in this exhibit. I was particularly drawn to W. Bradford Paley’s Codeprofiles, which visualizes “...how code is read by people, written by programmers, and executed by computers” (“Programmed”). Lines moved across the screen, representing how code is written, read, and implemented. I was entranced. This exhibit spoke to my interests outside of art, expressing the art behind programming and algorithms. As my family left the museum, we shared our favorite exhibits, finding that we each had different preferences; different works piqued our interest. Now I see that, perhaps, there is contemporary art for everyone. I believe that if you look around, you will find something that speaks to you. You just have to be willing to look long enough to find it. “Programmed: Rules, Codes, and Choreographies in Art, 1965–2018.” Hopper Drawing | Whitney Museum of American Art, whitney.org/exhibitions/programmed?section=3#exhibition-artworks.